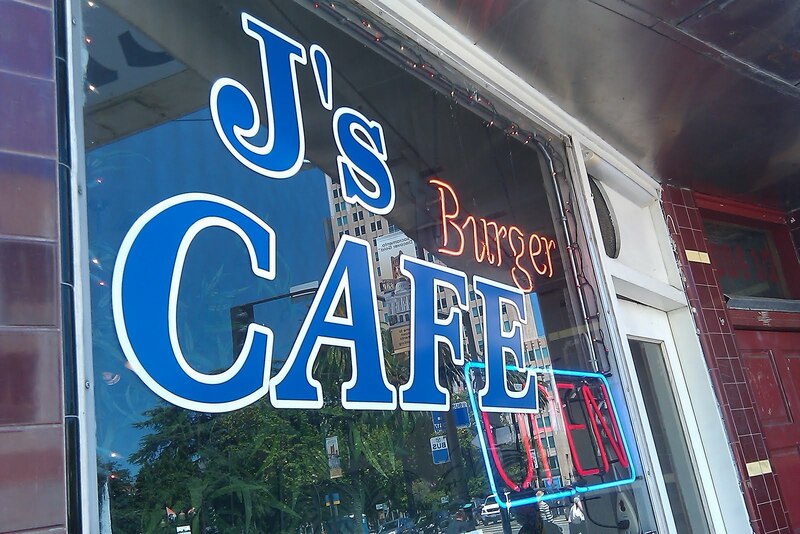 I have been going to J’s Café since the early 1990s and over the years the food has gone from excellent to poor to decent. I miss those days in the early Nineties when there was an innovative owner. On one occasion, while I was eating one of his latest creations, he stood over me asking how I liked his latest creation. I wanted to say I would like it better if he left me in peace, but he was a friendly person and you rarely meet a restaurant owner who seems so concerned about how his customers regard his food. The owner (I never got his name) told me he made yearly trips to Southern California looking for inspiration. “SoCal is a great place to get ideas.” The original J’s Burger was a 1/3 lb handmade charbroiled sirloin patty topped with pastrami, jack cheese, lettuce, tomatoes, grilled onions, pickles, and a dressing similar to but not exactly Thousand Island dressing on a toasted bun. The Monterey Burger had pretty much the same ingredients but with avocado instead of pastrami. Both were the latest innovations since his last SoCal trip. Ten years later variations of these two are still on the menu, though they do not taste the same. A few years later, after the Sacramento Bee and local magazines took notice of the small restaurant, things started to change. The man who spoke so passionately about hamburgers, pattymelts, and specialty sandwiches was no longer running the place. The food lost its unique flavor, and I stopped visiting the place as much. About ten years ago a Pilipino man bought J’s Café and the quality of the food improved a little. The food rose to the level of most State Workers troughs: good, but nothing remarkable. Today I ordered a Cheeseburger with fries. The burger is a 1/3 lb (originally frozen) patty with cheddar cheese, and the works (lettuce, tomatoes, grilled onions, pickles, and Thousand Island dressing on a toasted bun. 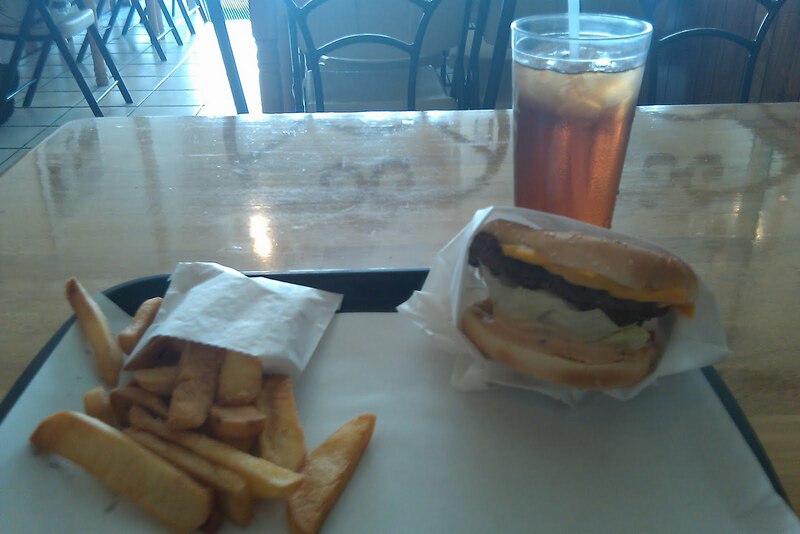 It is a good burger, but there is nothing outstanding about it. J’s keeps a steady clientele since State Workers rarely complain about this quality: it is clean, fast, and it tastes better than the alternatives at the same price. The fries are steak fries, which are good, if you like steak fries. As for me, I like anything that does not need ketchup. I can not eat steak fries without a bottle of Heinz on the ready. J’s Café is usually clean; however, it can get messy if they are busy. The staff is sparse and the person taking your order is usually the person cleaning the tables. So often, when there is an order line, I have had to consolidate dirty trays, plates, and cups to make way for my eating area. Overall, I like J’s Cafe, but I am pretty easy to please especially when it comes to lunch during the work week–I am finally out of my office and anything is better than that. If I came here for dinner, assuming they were open, I would not be such a pushover. Confession: I did not ride my scooter to J’s Café. There, I said it. For that matter, my future reviews of Jim-Denny’s and Cafeteria 15L, which I will spread out, will also be scooterless. In addition, if I ever review burgers from the up-scale restaurants of Chops, Ella’s, Grange, or Esquire Grill they will also be done sans Vespa. J’s Café like the other aforementioned are within walking distance from my office and all of them have irregular hours on the weekend. Remember, this is Downtown Sacramento. I grew up around motorcycles, mostly dirt bikes. My father was a successful Enduro, Hare & Hound Scrambles racer, and also was successful at hill climbing. I never got the courage to go fast enough to consider racing. When I was old enough to drive I had a Yamaha DX 125 that I rode to work and high school. I also used this dual-sport bike to ride with an older guy who lived around the block from me. Bruce Porter had a cool Bultaco trails bike and we would occasionally ride in an undeveloped area near the American River. I looked up to Bruce—he was older, a better rider (two things my father also was), and since he was not my Dad there was never the pressure of acceptance that always loomed whenever doing just about anything with my father. Bruce was just an amiable guy. One day I rode over to his house where he was working on a new motorcycle—a motocross bike he was building using after-market products. I walked up his driveway, pulling my helmet off my head, allow the helmet drop while holding the chinstrap, and then with the helmet dangling about eighteen inches or so from the ground, let it fall on his driveway. The helmet bouncing a few times before it rocked quietly to a stop. As manager of the JV football team, I saw players drop their football helmets in the locker-room in the same manner and did not see any reason to treat my motorcycle helmet any different. Bruce’s reaction was a mixture of shock and dismay. “Jack, what are you doing?” “What?” I replied, thinking his response was over-dramatic. “Every time you drop your helmet like that you are breaking down the fibers in that helmet and compromising the integrity of the entire design.” Since Bruce was always an accepting person I felt embarrassed and maybe a little betrayed. Flash forward some thirty years later and I am online looking up the names of people I knew when I was a kid when I found Bruce, the guy who preached to me about helmets, is now working for a leading helmet company! Bruce has been the Director of Motorsports of North America for Arai Helmets Ltd. for the over twenty-five years now. I remembered this video when it came to deciding what helmet I would select. Arai is one of the best helmets available on the market. True, you can use any helmet that has the Department of Transportation’s seal of approval: “DOT,” but Arai, along with Shoei and a few other high-end helmets are also Snell Certified. What this means is the Snell Memorial Foundation has passed this helmet after testing it under far stricter standards than the Department of Transportation. If you buy an Arai or any other DOT/Snell helmet you will be doing your brains a big favor, even at the expense of your wallet. I got a deal on my Arai, by purchasing a 2009 Arai Vector on sale rather than the 2010 Vector at nearly twice the price. Another thing to consider is the type of helmet you choose. The only way to go is the full-face style. Open-face helmets are easier to put on/take off and they are cooler; however, when choosing a helmet (as well as a jacket and gloves) the rider should be considering protection rather than convenience and comfort. Hybrids (with the flip-up chin piece) are a compromise between open- and full-face helmets—in terms of both accessibility and integrity of the helmet (upon impact). Okay, enough of my preaching about helmets, let’s ride!